The Nevada branch of the BLM is currently waiting for the Interior Department to give the go-ahead to begin planning for the 297,000-acre monument in southeast Nevada. Until then, there are few specifics about how the area will be managed — just guidelines in Obama’s proclamation. Locals are both excited and anxious to know what will change. Some are afraid of being locked out of Gold Butte, but the BLM says not much will dramatically change with the designation. Gold Butte, named for an abandoned mining town within its borders, includes both forested 8,000-foot mountains and low-lying sandstone formations. Conservationists began working to protect the region in the 1970s; since then, several wilderness areas have been designated nearby. Sen. Harry Reid, D-Nev., introduced or supported multiple bills since 2008 to designate Gold Butte as a National Conservation Area, none of which passed. 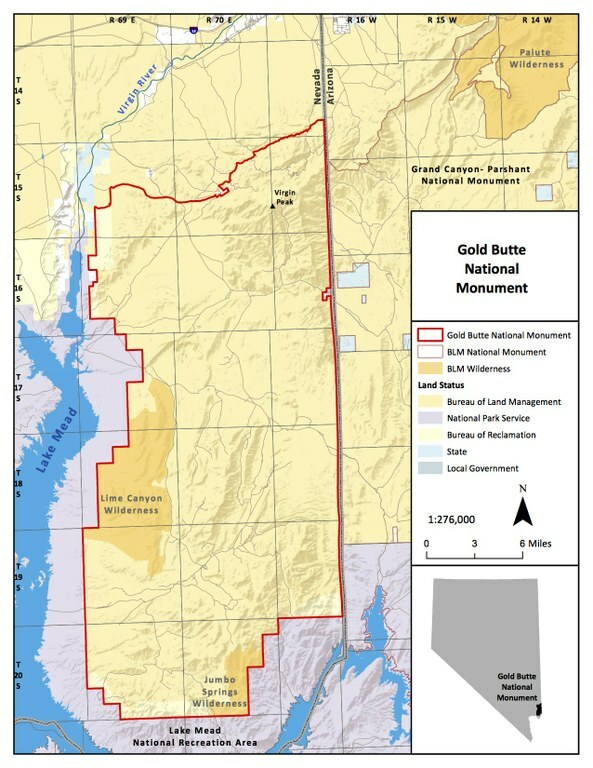 As Reid retired from 34 years in D.C. politics at the end of last year, Obama designated Gold Butte a monument. “It’s still fun to say its full name — Gold Butte National Monument,” says Jocelyn Torres, Nevada program director for the Conservation Lands Foundation. According to a survey by Colorado College, 64 percent of Nevadans supported the designation. The monument protects Paiute petroglyphs and other artifacts thousands of years old, unique plants such as the Las Vegas bearpoppy, pioneer-era structures, wildlife including the relict leopard frog once thought to be extinct, and the threatened desert tortoise, among other things. Vickie Simmons, vice-chair of the Moapa Band of Paiute’s tribal council, supports the monument, relieved to know her ancestral grounds will be protected. When she was growing up, Simmons’ family didn’t have a vehicle that could handle the rough roads through Gold Butte; it wasn’t until more recently that she realized how many Paiute artifacts were in the area. “For us, it’s like rediscovering your ancestral land,” Simmons, 57, told High Country News. Now she’s working to bring as many tribal members and Paiute kids into Gold Butte as she can. Some Paiutes say the land should be returned entirely to the tribe. But Simmons thinks that federal ownership is the only way it could be effectively protected. “We don’t have the infrastructure to manage anything like that,” she says. In contrast to conservationists and tribal members like Simmons, what appears to be a small but vocal contingent is furious about the designation. Road closures may be the biggest fear. Locals point to other places in southern Nevada where federal protection was granted and roads were then closed. “Show me a wilderness area or national monument where they didn’t shut roads down,” says Gene Houston, a local contractor. He gives Sloan Canyon National Conservation Area, south of Las Vegas, as another example where roads were shut down. Elise McAllister of Partners in Conservation, a local group that aims to give a voice to rural residents and the off-road vehicle community, is fifth generation from the area and says access to multiple places her family used to camp has been closed. “The off-road vehicle community sees that it continues to lose access,” says Shaaron Netherton, director of Friends of Nevada Wilderness. “I think they perceive any designation as going to do even more of that.” However, local BLM spokesman John Asselin says the agency isn’t likely to close roads in Gold Butte that weren’t already closed by a 2008 travel management plan. Gene Houston echoed Nelson’s concerns. “I didn’t do anything to the Indians, but I’m still paying for it,” Houston told HCN. 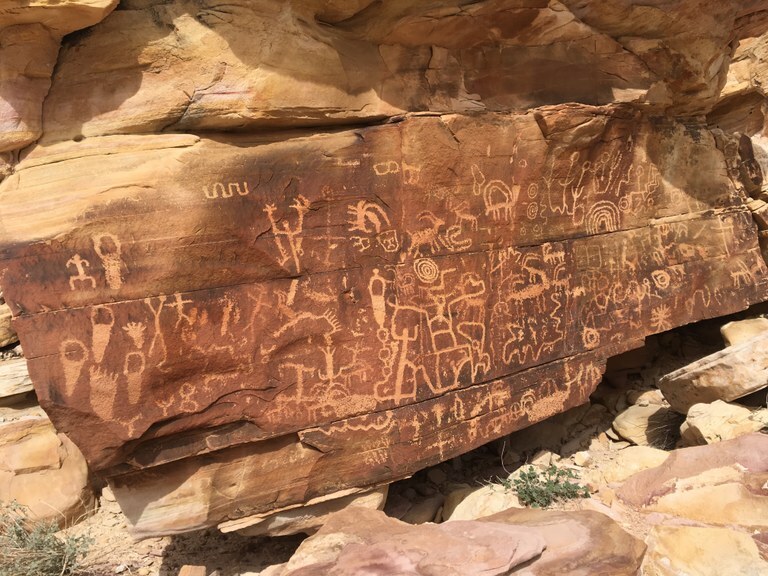 “They have their reservation, and they can do what they please on it.” Gold Butte once was part of the 2-million-acre Moapa River Reservation, which was later reduced to a fraction of that area, just 72,000 acres. Water rights have been another topic of conversation since the designation of Gold Butte. According to Mesquite city councilman David Ballweg, nearly 20 percent of the rights of Virgin Valley Water District, which supplies Mesquite and Bunkerville, are accessible from springs within the monument. Water managers from neighboring Lincoln County warned Mesquite officials that when Basin and Range National Monument was designated in 2015, the county could not use its right-of-ways to get to its water. But that situation has been avoided thus far in Clark County; after years of discussion, Virgin Valley is being given explicit access to its water within Gold Butte. As for mining, new claims have been prohibited for years and that won’t change. The area has also been almost entirely closed to grazing since 1999, at least officially. As Cliven Bundy awaits his federal trial for the 2014 armed standoff near Bunkerville, his cows still illegally graze in the monument. Two Arizona BLM grazing allotments that bleed over the state line into Gold Butte may stay open because the monument proclamation states that any “existing rights” will remain untouched. Petroglyphs in Gold Butte National Monument. The Interior Department did not respond to HCN’s questions regarding when they will greenlight the start of a new management planning process. A local advisory council of representatives from various stakeholder groups will help Nevada BLM create the plan — a public process that could take years. Signs and toilets are likely the first changes visitors will see, followed by increased law enforcement to make sure people are sticking to designated roads and trails from the 2008 travel plan and not harming artifacts. Nevada BLM received $500,000 for Gold Butte’s management shortly after the proclamation in December. It’s unclear whether President Donald Trump’s administration will provide that level of funding next fiscal year. The BLM could also seek additional funds under the Southern Nevada Public Lands Management Act.